Pakistan has been blessed with every weather, resources, wild life, birds, mountains and plains that interest all categories of tourists, adventurers, mountaineers, trekkers, bird watchers and wild life lovers. Today's post is for those who can dare and climb up the snow clad mountains of Pakistan's northern areas and watch some of the near extinct species of wild life, like the Deosai plains bears, Marco Polo sheep, the mighty twisted horned Markhor and the agile snow leopards. 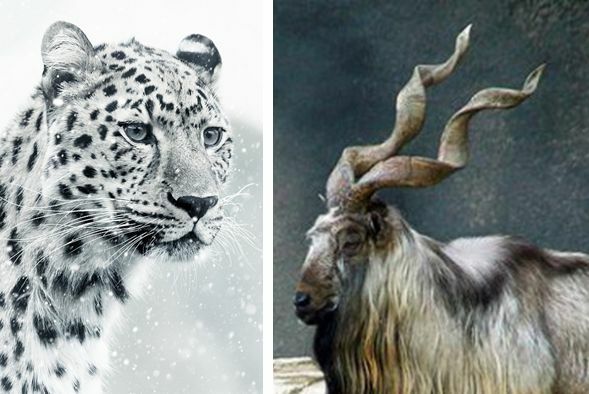 Before we talk of the adventure that awaits the wild life lovers, let me introduce to you the Markhor and the snow leopards. Markhor, with its long twisted horns, is the national animal of Pakistan. The excessive hunting of this beautiful animal has reduced its population to few thousands and is at the risk of extinction. Markhor which is a member of the goat family and has its habitats in sparsely wooded mountainous regions at altitudes ranging from 700 m (2300′) from November to May up to 4000 m (13,000′) in the summer. The Markhor forages tussocks of grass about 8 – 12 hours daily, and it is usually active all day except for several hours in the middle of the day, when it rests and chews its cud. Besides Pakistan, Markhor is also found in area that extends from Turkmenistan, Uzbekistan and Tajikistan to Afghanistan, Pakistan and northern India (Kashmir).